This is a collection of stand-alone mysteries with a common theme: narrators draw their listeners in to their haunting tales, and these stories have a shocking, life-changing connection to the listeners. The Mystery Man is a time-travel romantic suspense, The Mystery Box is a psychological thriller, and The Mystery Tomb is an archaeological mystery. 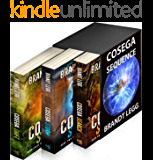 Readers have called them page-turners that will keep you up until you reach the end. An enjoyable action-packed read which should appeal to all readers of thrillers and those interested in archaeology. The descriptions of native American catacombs and rituals were fascinating, and a touch of romance made it a real page turner. 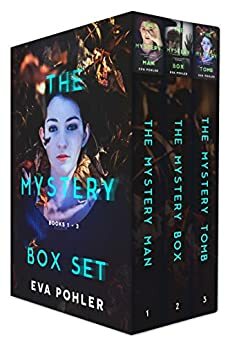 The first two stories in the Mystery box set were excellent, I was reading well into the night, the third story was a disappointment..
5.0 out of 5 starsLove! LOVE! The way Eva weaves in and out of the storylines in each of these books so flawlessly, makes these standalones priceless. 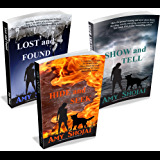 She's always been my favorite author, but the mystery series enticed a more mature part of my interest, and quickly became a favorite of her series. Wonderful deal on the set! 5.0 out of 5 starsMust Read!!! These books are fantastic! They address real issues in a fun, and suspenseful way. Pohler is an excellent author, and you should definitely not miss this series! 5.0 out of 5 starsPrepare to be fully involved in this book. A great read. The story, "The Mystery Box", that gives this set its name, is worth the price (and much more) all by itself. It's very hard to classify. Sometimes it's a mystery, sometimes predictable. It's both a horror story and a love story. It will leave you outraged sometimes, crying at others. It will set your nerves on edge, and tug (hard) at your heartstrings. Reading it is like being on a very strange rollercoaster. It will run your emotions from one end to another. In several places, it's hard to read without shuddering, shivering, cheering, rejoicing, and crying. The characters are so well written, the plot so intricate, and yet so simple, that it involves you fully in the story without being aware of it. You start in a simple life, with a bored housewife. By the end, if you aren't crying, or at least have tears in your eyes, you are a stronger person than I. It's one of the best stories I've read in my 74 years on this earth. I enjoyed reading the second story, especially the information about the Native American tribe. How much of the information presented is fact or fiction, I don’t know since I have not done the research myself; however it was intriguing and thought provoking. The story itself seemed to go on forever, though. I can say the same about the first story as well - I stuck with it, but shorter would have been better. I feel hesitant saying this, because it reminds me of the King’s comment in the movie “Amadeus,” when asked if he liked the composition just played, he said there were just “too many notes.” Sorry, but I feel that these stories just had too many words that delayed the action.